My thread for any designs that really need your opinions! I'll be moving things over here as I get the free time. Taking a quick break from the brainbuster that is Astral Plane Dr. Strange. I was looking over the Intergang Agents and wondering why I never played them. 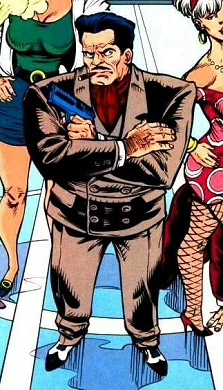 So I came up with an Intergang friendly Crime Lord: Bruno Mannheim. Thoughts? I could see dropping Vicious Recruitment all together. EDIT* I was just reading through the Intergang Agents thread and Bruno gets called out a handful of times but I guess nothing came of him. Also Pecking Order is a slightly tweaked version of something Johnny139 came up with and I thought it was great. I also threw in an Underboss Uncommon that would be a filler leader as well. After revealing an Order Marker on this card, instead of taking a turn with Bruno Mannheim, roll the 20-sided die. If you roll a 7 or higher you may take a turn with a criminal squad you control. If you roll a 6 or less, you must take a turn with a New God you control instead of Mannheim. After using the Pecking Order Special Power, choose one Criminal or Thief figure wounded by an Intergang Agent you control. If it is a figure you control take an immediate turn with that figure. If it is a figure your opponent controls they may allow you to take an immediate turn with that figure. If they do not, place one wound marker on the chosen figures card. Instead of attacking with Underboss you may attack with a common Criminal you control within 6 clear sight spaces of Underboss. When attacking with an Intergang Agent you control within 6 spaces of an Underboss you may subtract one from his attack number. When attacking with an Intergang Agent with the Direct Order Special Power, you may add to or subtract one from his attack number. I was eyeing up the Astral Dr. Strange figure and it got me thinking what that would look like in C3G. What do you guys think? Would he be a figure similar to the Mysterio Holograms? Or maybe a stand alone hero that can also be drafted with the Sorcerer Supreme? I like the idea of it being a possible standalone cheap Strange, that can also take turns after you reveal an OM on Dr. S.
You may draft this Dr. Strange into an army containing one other Stephen Strange figure. After revealing an order marker on a Stephen Strange figure you control, instead of taking a turn with that figure you must (may?) take a turn with this Dr. Strange instead. When this Dr. Strange is attacked by an opponent's figure that does not have the Magical Defense special power, the most wounds Dr. Strange can take from this attack is one. 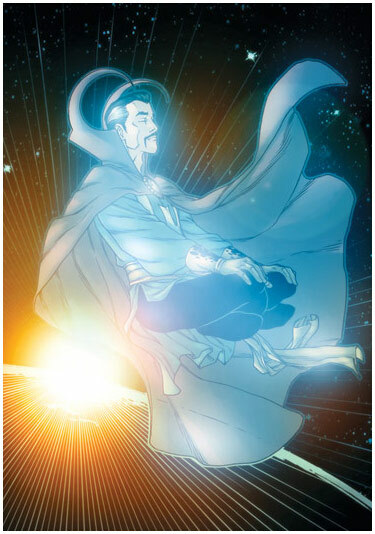 Might need a “must take a turn with Dr. Strange” in ASTRAL PROJECTION since Strange’s body is essentially sleeping while he is projecting himself and so it doesn’t feel like two different people. I took a stab at 50% Chad. Currently he is a little wonky as attacking has the potential of losing his stinky aura effect his on opponent. I’d love to hear thoughts/ideas on this guy, especially in regards to his class/species/personality. All figures that are not Androids or Constructs within 1 space of 50% Chad subtract one from their attack. When counting spaces for 50% Chad’s movement, elevation changes up to 4 levels count as one space. You may ignore 50% Chad's height of 7 when climbing. 50% Chad may step over water without stopping, step over figures smaller than huge without becoming engaged, and step over obstacles with a height of 4 or less. When attacking an opponent's small, or medium figure, if 50% Chad rolls equal or more skulls than the defending figure you may place that figure one space away in a straight line. Next up, Zombie Giant-Man! This guy kept a living Black Panther to chop up and eat in order to satiate his hunger, even the miniature has him carrying around a helpless T'Challa. Any thoughts? 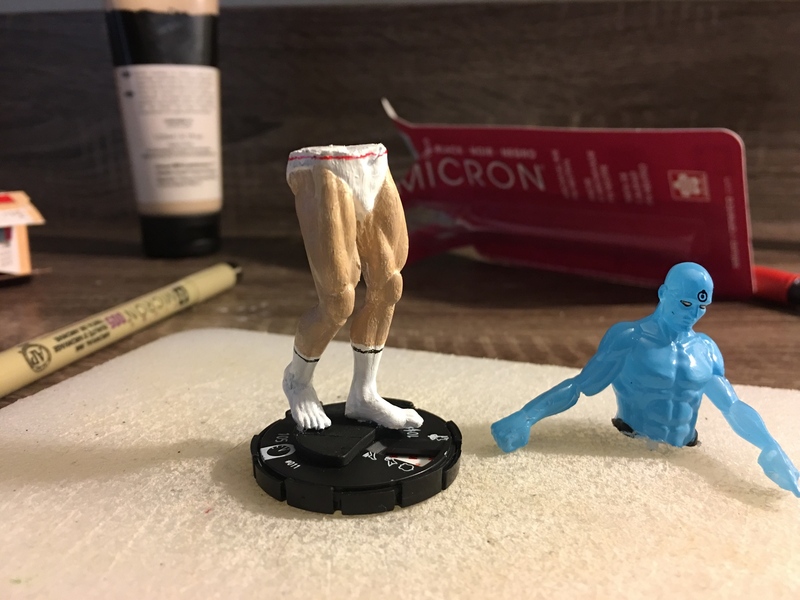 The figure used for this unit is a Heroclix figure from the Mutations & Monsters set. Its model number and name are #028 / Giant-Man. Start the game with 4 [color] T’challa Snack markers on this card. Instead of attacking you may remove, if possible, 1 T’challa Snack marker from this card. If you do you may also remove 1 Wound Marker from this card. After an opponent reveals a numbered Order Marker on an Army Card that opponent controls, you may immediately move Giant-Man up to 2 spaces. When moving with Zombie Galacti, Giant-Man will take any leaving engagement attacks. 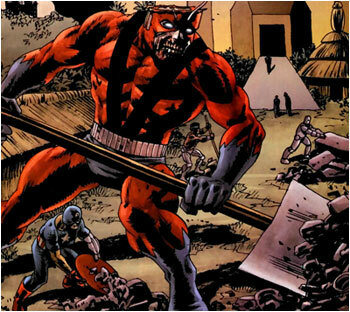 Giant-Man may add 1 to his range when attacking a figure whose base is no more than 6 levels higher than his height or 6 levels lower than his base. Last edited by L0B5T3R; February 18th, 2019 at 10:01 AM. What in god's name is that? Land sharks that die in water? What acid trip was this dreamed up in? Anyway, looks fun - Blood Scent should make them fairly dynamic and mobile, and they seem quite scary. 100 seems very low unless you drastically nerf their stats - not sure what they're like in universe (or even where in god's name they're from), but 5 Defence feels a tad high thematically for feral sharks anyway, I think I'd prefer them as glass cannons if that's thematic. These need to happen, anyway - we need more sharks if we're ever going to do a Glyph of Utility: Shark Repellent. I highly recommend the miniseries LO. It's very short and very funny. The reason for the low cost was because they will be taking a lot of leaving engagements even on their own turns. Something the higher defense was supposed to help with as well. But if we go with something like Devour then they'll be mowing down Commons like lightning. So low survivability might be necessary. 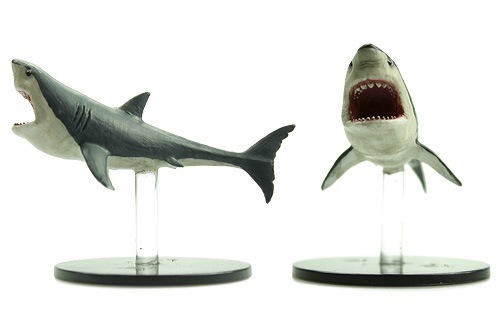 Don't know if you're looking for miniatures for this or not, but Pathfinder has a wereshark, another wereshark, and a regular old (great white) shark. Depending on the type of thing you're looking for, any of those could be options. The body of the shark is identical to a typical great white, which means the last ones you linked are perfect! Whenever a figure receives a wound but is not destroyed, you must (may?) immediately move this Grizzly Shark as close to the wounded figure as possible, moving up to a maximum of 3 spaces. This Grizzly Shark will take leaving engagement attacks while moving with Blood Scent. When Grizzly Shark attacks, he receives 1 extra attack die for each Wound Marker on the defending figure’s Army Card, to a maximum of 2 additional attack dice for Feeding Frenzy. At the end of the round, destroy this figure if it occupies a water space. What you've got there is more like Blood Frenzy off Wild Child. I think Blood Frenzy makes more sense for these guys. These need to happen, anyway - we need more sharks because we're ever going to do a Glyph of Utility: Shark Repellent. GRIZZLY SHARK! Drown is hilarious! This is awesome. Thanks Scape! The more I think about these guys and their theme the more I see them as autonomous heat seeking missles. Whenever a drop of blood is spilled they zoom across distances and just chomp. One chomp one kill. I think devour gets that across better than blood frenzy. Updated the OP looking for some advice with Goliath Bill Foster. Goliath may only use Giant Crush on a figure he chose for Giant Carry this turn. I don’t know if that’s too ruthless for this character though. He seems like a good-natured guy. A biochemistry power sounds cool too but I don’t know enough about the character to say anything more than that.